Ford showed off an updated Fiesta at the expo with new looks and features. We spent a day behind the wheel of the 2014 Ford Fiesta. Read on to check what's new. The new Ford Fiesta in India subscribes to the global look that the American company will like to call as 'Kinetic 2.0'. Out goes the old grille and in comes in a very Aston Martin like front fascia. There are oodles of chrome on the hexagonal grille. The headlamps have been moved to the top now while the fog lamps are also larger with bezels around them. The bumpers and bonnet are also new. Ford hasn't changed the side profile though you do get new 15-inch alloy wheels, which look nice though feel more like an aftermarket unit. The tail lamps also are longer now. The new Fiesta gets updates to the Sync system, similar to the one in the EcoSport. The cabin of the new Fiesta isn't a big departure from the outgoing car. What's new is the ice blue illumination for the instrument panel, soft touch plastics and contrasting beige fabric for the seats. The front seats remain as supportive as before but they get scoops at the back to improve knee room for the rear passengers. Ford claims that the repositioned rear head rests increase comfort. This doesn't change the fact that the Fiesta doesn't have one of the most comfortable rear seats in the category. The boot space is as accommodating as most C-segment sedans with 430 litres on offer. What the new Fiesta gets is updates to the Sync system, similar to the one in the EcoSport. It now comes with AppLink which lets your smartphone display some apps onto the car's infotainment system. Like in the EcoSport, it will read out your messages, dial and answer calls for you as also find you the nearest restaurant or even temple (data connection required). In the unfortunate case of an accident, Sync will contact emergency services through the Emergency Assistance feature. There is also automatic climate control on offer. You also get automatic headlamps, rain sensing wipers, rear parking sensors and cruise control. Ford has also made a driver airbag as also ABS with EBD standard across trims (there are three trims). Apart from the base Ambiente trim, both the Trend and Titanium variants get passenger airbag as well. Ford has tweaked the 1.5-litre diesel motor to make an additional 1PS for a total 91PS while torque remains the same 204Nm. It comes mated to a 5-speed manual transmission. 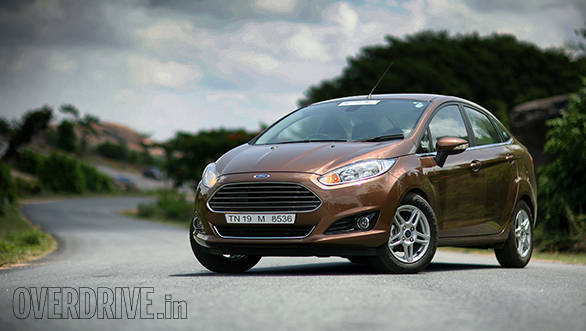 Ford now claims 25.01kmpl fuel efficiency from the Fiesta diesel, second only to the Honda City's 25.8kmpl. Ford has done it by reducing the drag through aerodynamic improvements to the body work. On the move, the diesel engine displays an urgency to rev and turbo lag is under control. The independent McPherson strut front and semi independent rear remain unchanged as well. This Ford continues to be a joy on the twisties. The ride quality, while not the best, is far from unpleasant. The recalibrated steering feels great to use, nimble at low speeds while weighing up nicely at high speeds. 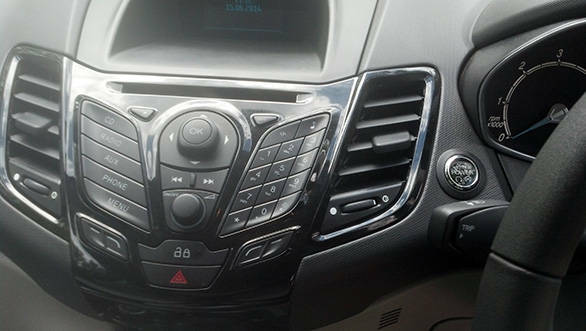 Ford claims to have reduced the NVH levels inside the cabin. However on the go, there still is a fair bit of noise creeping into the cabin. If you are looking for a petrol engine or even an automatic, then you are going to be disappointed. Ford has discontinued the 1.5l petrol engine and the PowerShift transmission in this new car. The 2014 Fiesta can only be ordered in diesel and in six colours. Ford will be launching the car on June 19. 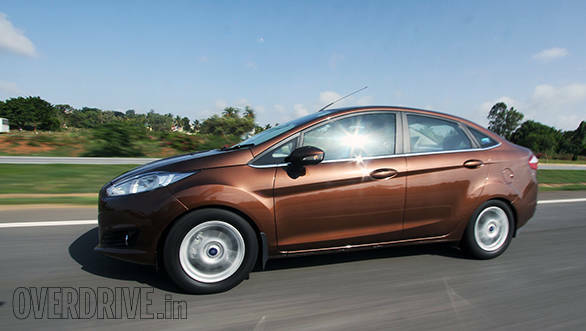 The American company says that they have learnt their lesson with the second-gen Fiesta and will be pricing the 2014 edition very competitively. Also, the company is very clear on this being a niche product and they aren't looking at directly taking on established rivals like the new Honda City or Hyundai Verna. 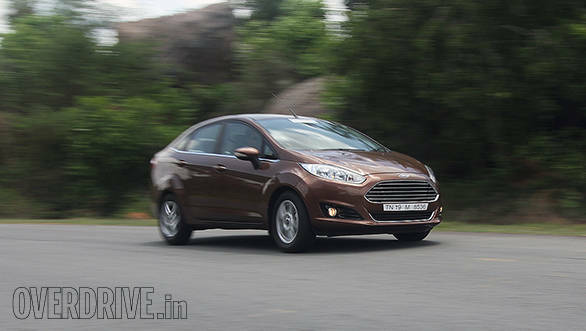 Expect Ford to price the Fiesta between Rs 7.5 to Rs 9 lakh, ex-showroom.